Brandon Crawford isn't a guy that scares pitchers, but Brandon Crawford, despite his natural abilities as an offensive threat, is probably the smartest guy on the field. 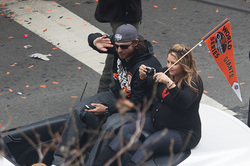 Brandon Crawford is 6'2", 215, he's athletic, he has a great glove - but what does that mean in terms of fantasy stats? Before last season, it didn't mean much. But when you look at Crawford's career work as a whole, so far, he has steadily improved his power output, realizing that he's strong enough to do it and smart enough to figure out how to do it. When Brandon Crawford first showed up in the big leagues and became the Giants' permanent shortstop, at first, he was nothing more than a good glove. But we could see the wheels turning in his giant, bearded head as he matured, learned, worked on what needed improvement, and focused on what the team needed him to do. Brandon Crawford is in a good spot: he's on a team that expects to win at all costs, hence, he's doing his part and even more. *Traded in slapped base bits in the gap (10 triples in 2014) for better power numbers in 2015 (21 HR, 33 doubles). *Fewer walks looks like a conscious effort to drive in runs in the absence of injured run producers. *Increased batting average indicates he learned a lot last season while being asked to take on more of an offensive role. We expect the batting to rise even more if his teammates stay healthy, relieving him of the stress level of having to drive in runs. When the Giants lost guys due to injury last season, Brandon Crawford stepped up his power game and hit a career-best 21 HR with 84 RBI. Had Hunter Pence been in the lineup, we may have seen something more like 15 and 60 (still not bad). Looking at Crawford's stats, we saw a bit of an anomaly: his walks went down as he became a better hitter. What does this tell us? It means he likely made a conscious effort to try to hit the ball with more power and/or swing more often with guys on base. Mostly, it worked, hence the 84 RBI, 21 HR and career-best .256 batting average. But because he purposely tried to put the ball in play more when his team needed it the most (and the Giants almost snuck into the playoffs last year, too), we saw his strikeouts stay pretty high while his walks dropped significantly. Another difference is that he hit 10 triples in 2014 with just 10 HR. With his more-aggressive power effort, he ended up hitting just 4 triples while hitting 21 HR. He also upped his doubles from 20 in 2014 to 33 in 2015 - a pretty clear sign that he was swinging ahead of pitches more, turning on them and crushing them down the line instead of slapping them into the giant gaps in AT&T Park. All in all, we don't see any reason why he would have to consciously try to hit for as much power, but now that he has that swing as part of his mechanics, we may see the power continue. With presumably less pressure on him, pending the collective health of his teammates, we see Brandon Crawford hitting 17 HR with 70 RBI, but we expect a career-high in runs (70-80) and batting average (.270). Don't draft him too early, but don't be afraid of a significant downfall in his stats. Also, feel free to take him for $10 or so in an auction draft.